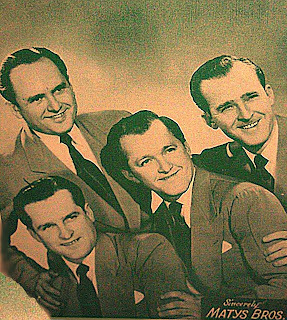 The Matys Brothers were a rockabilly musical act made up of the four Matys brothers, born and raised in Chester, in the Philadelphia area . The quartet's first record_Muskrat Ramble. released on the Essex Records label, was a big hit in 1954, and by 1956 the group was part of Bill Haley's talent and booking stable and recording for Decca Records. The_Muskrat Ramble. flipside_You're The Moment Of A Lifetime. from 1954 is an unknow primitive oriented doo wop (or du-duá) side.